Polycarbonate Sheets Melbourne by Industrial Plastic Solutions. Polycarbonate sheets are a tough transparent plastic with a high impact strength. Commonly used in Prisons and Psychiatric facilities where it is important that the plastic material cannot be broken and used to self harm or injure inmates in particular staff. You can be assured that our range of Polycarbonate sheets in Melbourne are the standard for security applications. Victorian Police currently use riot shields made from Polycarbonate that have been modified by Industrial Plastic Solutions. This material is so strong that it can be hit with a baseball bat and easily withstand the impact whilst maintaining its integrity. Polycarbonate has 250 times the impact strength of glass, and 30 times the impact strength of Acrylic or Perspex making it virtually unbreakable. Polycarbonate Sheets also have a 40% better thermal efficiency than glass. Polycarbonate has lower maintenance costs than both glass and acrylic. Polycarbonate sheet can be formed into tough Machine Guards for industrial uses, where tough safety screens are required to protect machine operators. (Lexan Hard coat Mar resistant) or (Sheffield Makrolon AR2) and range in thicknesses from 1.0mm – 12mm. You have the choice of selecting a general purpose grade or a uv2 grade suitable for outdoor usage. Safety and Vandal resistant windows in shops and schools. Standard sheet sizes are 2440mm x 1220mm. Over-sized sheets are available upon request in the following sizes, 1830 x 2440mm, 2050 x 3050mm. 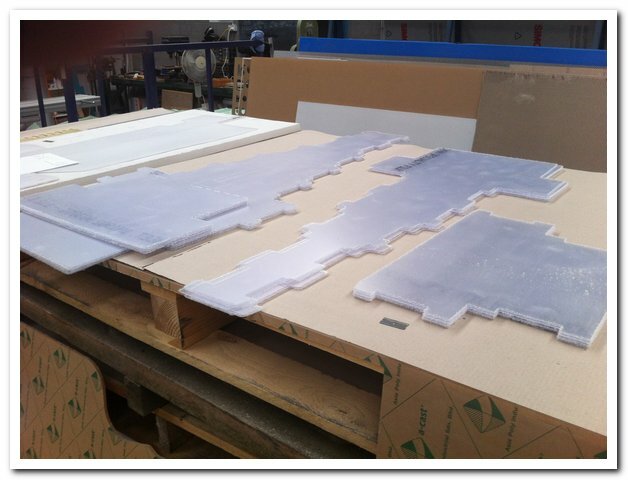 Polycarbonate sheet thicknesses come in a range from 1.0mm, 1.50mm, 2.0mm, 3.0mm, 4.5mm, 6.0mm, 9.5mm, 12.0mm and 12.70mm.